The 37-year-old comic realised not long after she started dating Chris Fischer - who she married in February 2018 following a whirlwind three-month romance - that his "brain was a little different" and explained it's because he has the condition, which is a form of developmental disorder autism and can cause difficulties with communication and social interaction. 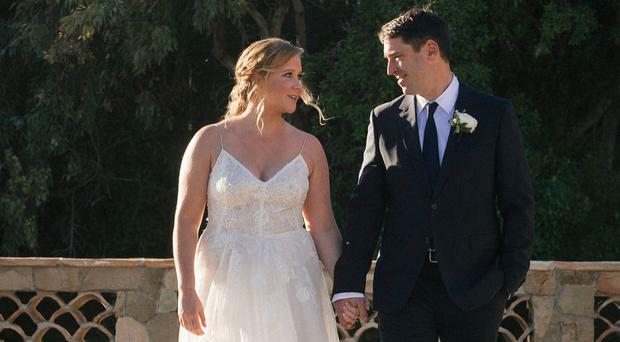 In her upcoming Netflix special 'Amy Schumer: Growing' she told a crowd in Chicago: "I knew from the beginning that my husband's brain was a little different than mine. I have to start this over because I really want to get this right because I love him very much. "My husband was diagnosed with what used to be called Asperger's. He has autism spectrum disorder. He's on the spectrum. And there were some signs early on." The 'I Feel Pretty' star - who is expecting her first child with the chef - went on to admit she has shared a lot of "'Huh' moments" with her husband, starting from when she fell over on one of their first dates. She continued: "Nine out of 10 people would go, 'Oh my god, are you OK?!' Maybe more like 10 out of 10 people...Instead, my husband went-- He kind of froze and became a lighthouse, opening and closing his mouth. "I remember lying on the ground looking up at him and I wasn't mad, I just thought, 'Huh'. Lotta 'Huh' moments, you know?" But the 'Trainwreck' actress is unfazed by his condition and admitted one of the reasons why she fell in love with him was because "he keeps it so real" and always tells the truth. She said: "Once he was diagnosed, it dawned on me how funny it was, because all of the characteristics that make it clear that he's on the spectrum are all of the reasons that I fell madly in love with him. "That's the truth. He says whatever is on his mind. He keeps it so real. He doesn't care about social norms or what you expect him to say or do."